Chef Mohammad Zaman prides himself on serving up homemade cooking your grandmother would be proud of - assuming your grandmother is Italian, that is. Zaman - or Chef Z, as his customers know him - is the owner and chef of Omezzo Italian Restaurant, 1755 Hill Rd. N. Open since 2013, the restaurant quickly gained attention, taking home the coveted Purple Spatula award at last year's Taste of Pickerington. Born in Bangladesh, Zaman came to the U.S. when he was 18 to study computer programming. While he was in school, he worked in an Italian Restaurant and quickly discovered his passion for Italian food. Post-graduation, he moved to Cincinnati after finding a programming job. He spend about 2 years in that line of work before ultimately realizing it wasn't for him. "I had worked in restaurants all my live," Zaman says. "Making people happy with food was my passion." And so he went to work in the restaurant business again, taking jobs at restaurants such as Lindey's, BRAVO!, Cucina Italiana and Brio Tuscan Grille. For eight years, he further honed his skills and learned ever more about Italian cooking> It was only a matter of time before he decided to open his own restaurant. "I wanted to do it for myself," Zaman says. 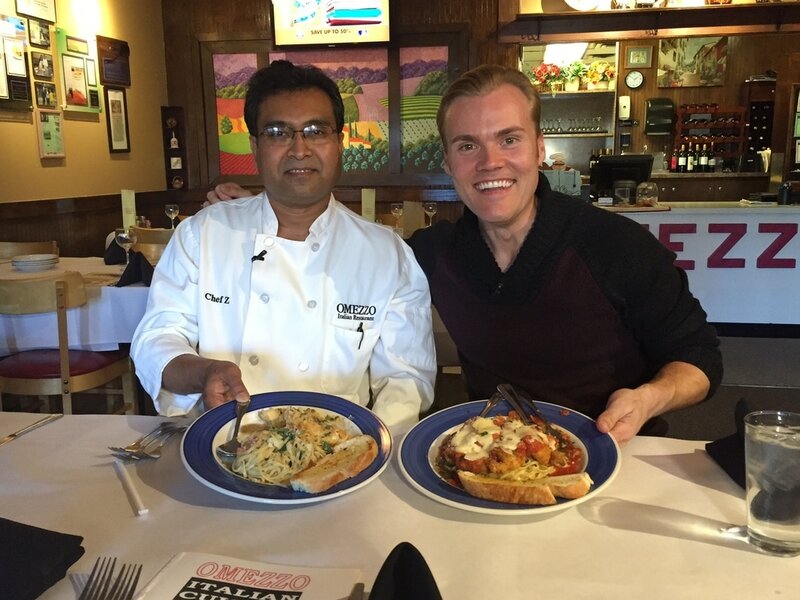 Omezzo is the first solo venture into the culinary world for Zaman, now a Pickerington resident. The restaurant's name is Italian for "one half," denoting the comdination of styles of the menu. Italian cooking is clearly the heart and soul of Omezzo, as even cursory glance at the entrees - including baked ziti, chicken pomodoro, shrimp penne alfredo, lobster ravioli, cheese trotellini carbonara, eggplant and rigatoni Bolognese - will indicate. The restaurant lends its name to three items on the menu: the Salad Omezzo, with lettuce. onions, tomatoes, roasted red peppers, parmesan-crusted chicken and ranch dressing; the Pasta Omezzo, with roasted red pepper cream sauce, mushrooms, chicken and rigatoni; and the Trio Omezzo, cheese tortellini with pesto cream sauce, lasagna and chicken diavolo. Pizzas, soups and desserts - including tiramisu and cannolis - round out the menu. Zaman changes up the menu every six or seven months he says. ​Fresh ingredients and home-style cooking are a couple of Zaman's biggest points of pride. He emphasizes that each meal is made from scratch and that he makes his own sauces fresh everyday, utilizing local ingredients - including some from his own garden - whenever possible. ​Zaman will return to the Taste of Pickerington this year to defend his title. Last year's winning cobination was his home-made lasagna, chicken Alfredo and tiramisu. This time around, he's considering bringing back the chicken alfredo, but switching out the lasagna for spaghetti with meat sauce or meatballs. Taylor Woodhouse is a contributing writer. Omezzo Restaurant & Pizzeria. All Rights Reserved. 2018. Designed by EMS.